Vinally, a record hop you can sink your feet into! Join three top rockin’ record jocks and dig the sounds that must be dug—killer rockabilly, hillbilly bop, gyracious R&B, exotic instrumentals, and wild rock ’n’ roll that’ll flip your wiggle. Check your holiday blues at the door and have some fun, fun, fun. 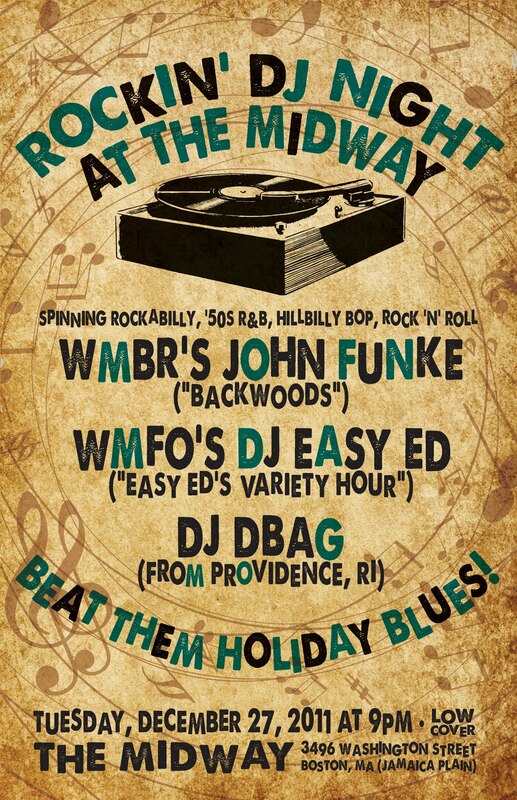 Platter master extraordinaire John Funke, host of WMBR’s “Backwoods” and dean of the decks at all the top nightspots. 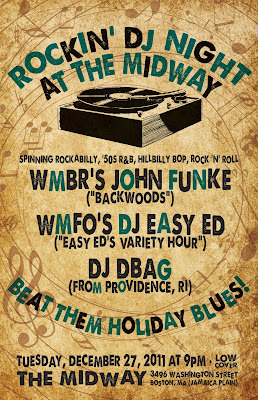 WMFO’s DJ Easy Ed, host of “Easy Ed’s Variety Hour” and regular guest DJ at River Gods. Derek Malone (DJ DBAG): The bass-slappin’ man from Providence, RI. He’ll be hittin’ the decks and hittin’ ’em hard.